The Technomad Oslo was developed specifically for the demanding requirements of themed entertainment applications both indoors and outdoors. It is one of the most powerful subwoofers available due to its very low frequency response (below 40Hz) and high power rating (1200 W continuous). 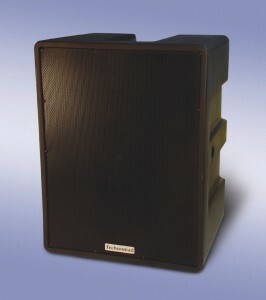 These specifications combined A high max-SPL rating of 133 dB confirm that the OSLO is a formidable low-bass system. The high-power, all-environment Oslo features a single 18-inch low-frequency driver, making it the only completely weatherproof subwoofer currently available in the 18-inch format. The Oslo also offers excellent performance in the mid-size subwoofer class due to its single 18-inch low-frequency driver, making it the only completely weatherproof subwoofer currently available in the 18-inch format. Technomad will also offer the Oslo in a powered configuration featuring a 1600 W weatherproof amplifier module based on the company’s PowerChiton amplifier technology. Though primarily designed for fixed and permanent applications like theme parks and sports venues, the Oslo is also ideal for temporary applications including live sound, corporate audio and theatrical performances. The design also gives sound engineers and integrators the flexibility to specify and install the Oslo within underground installations and for framing into sets and themed backgrounds. Like all Technomad loudspeakers and subwoofers, the Oslo offers both outstanding audio quality and 100 percent weatherproof construction thanks in part to IP56-rated protection, proprietary driver treatments and self-draining cabinets. The Oslo is also available in 14 custom molded-in colors that do not crack or fade in sunlight.